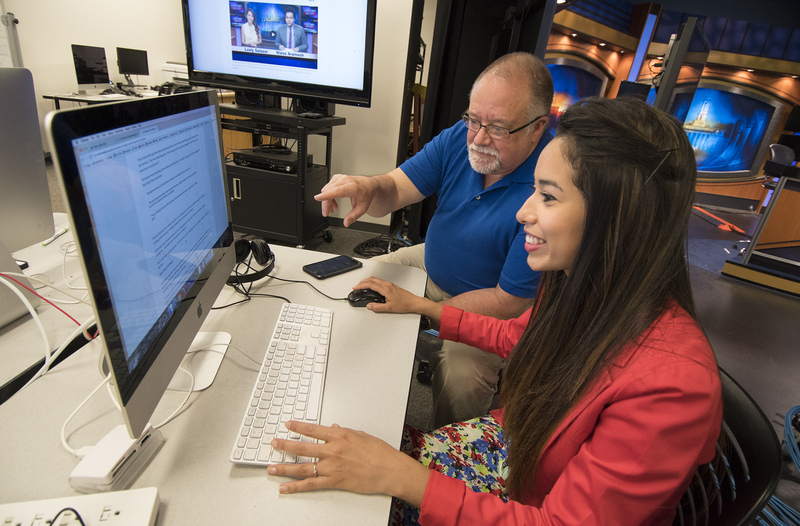 Instructor and student work at a multimedia newsroom computer next to the Centre County Report newscast set at Penn State University. In my former life as editor for online innovation at post-gazette.com in Pittsburgh, my role was to figure out how to report and deliver the news to a digital audience. This was in the early 2000s, when there were plenty of opinions on how to do this, but little hard data or actual experience. So I spent a lot of my time creating prototypes. Verse, a tool designed for narrative storytelling, might provide a way for broadcasters to more effectively reach an online audience. In the lean startup culture that drives news innovation today, these prototypes are called minimum viable products. The ethos is don’t talk about trying something new – make it, get feedback, listen to what people are saying and make a better version. This innovation process was in the back of my mind last semester as I worked with Penn State senior Lesly Salazar on an independent study. We decided to package her project in a video presentation platform called Verse, an interactive tool that allows viewers to choose how to navigate a story that has a central narrative and numerous sidebars. Her story focuses on the often-contentious relationship between students living off-campus at Penn State and their landlords. It includes multiple interviews, survey results and some data visualization. The Verse platform was an obvious match. We dove in. Salazar doesn’t like to be pigeonholed. Officially she’s a broadcast major, but in her official Donald P. Bellisario College of Communications profile she describes herself as a “multi-skilled journalist.” She is equally adept in front of and behind the camera. Her ambition is to create character-driven video stories for television-affiliated websites. Last semester, while she was doing the independent study with me, she was also anchoring Centre County Report, the student-produced newscast that airs across 29 counties in central Pennsylvania. As a web producer she knows that television-style newscasts have never had much traction online, but it occurred to us that Verse, a tool designed for narrative storytelling, might provide a way for broadcasters to more effectively reach an online audience. Audience engagement is a constantly evolving challenge for all journalists, including reporters working primarily in video. Cord-cutters move from cable to streaming video. Viewers watch stories on their phones and on TV, often at the same time. Broadcasters have lost their monopoly on live breaking news to anyone with a smartphone and a Facebook account. Presentation that works on one platform may not draw viewers on another. Meanwhile, as educators, we’re training thousands of students to do broadcast TV, even though we can only guess at the future of newscasts. We do know that the process of creating a traditional television newscast involves both science and art. Producers know when viewers tune in and when they’re likely to reach for their remotes. Tightly edited stories are slotted into highly formatted programs designed to provide an entertaining and informative experience. It’s a formula that works – on television. Online is a different story. That’s because watching TV news is a passive activity. Viewers may have the newscast on, but they’re also making supper or interacting with a pet. That’s why television stories seem to be a bundle of hyperkinetic activity punctuated by reporter stand-ups. Everything is designed to attract the wandering attention of a distracted viewer. Watching online video is an active pursuit, prompted by the viewer’s choice to engage with that content by pushing play. They are actively waiting for the result of that decision as they look at their screen. Often, that screen is on a phone. A decade ago some of the most innovative work being done to create newscasts for online viewers was being attempted by newspapers. Two newspaper chains, Scripps and Gannett launched major initiatives to bring video news to their viewers. In 2005 the Scripps chain hired web guru Rob Curley to create a cutting edge digital news operation at the Naples Daily News. Scripps executives were particularly interested in leveraging an apparent advantage in the local video news market, which includes both Ft. Myers and Naples. The TV stations are based in Ft. Myers and have to split their newscasts between both cities. The Daily News created a newscast devoted solely to Naples that would air on cable and online. The Naples market is upscale and had high broadband penetration. The publisher was committed to making the experiment work. On paper this newscast – Studio 55 – had obvious appeal. Studio 55 was notable for its production value at a time when web video generally looked shaky and haphazard. The newsroom anchor and production crew were young, energetic and talented. Three years after launch, the Daily News discontinued Studio 55. Even though the newscast could be viewed on demand in a market of television-aged viewers, site metrics showed a clear preference for shorter stories that could be viewed a la carte. A 15-30 minute newscast never caught on. As Scripps developed Studio 55, Gannett was trying a similar experiment at LoHud.com in wealthy Westchester County, New York. The Journal News partnered with a 24-hour infomercial channel to air two hours of news each night on local cable. Westchester County has a lot in common with Naples. Located on the northern edge of the New York metro TV market, Westchester is decidedly upscale. It’s also an afterthought in the vast New York television news market. Once again, a Westchester-specific newscast seemed destined for success. LoHud recruited anchors and a sportscaster. They generated video content by using both TV-style videographers and newspaper photographers equipped with video cameras. And once again it failed – the victim of clear audience preference for individual stories over a produced newscast. Armed with this history of what didn’t work, Salazar and I decided to see if a new approach might yield different results. Salazar had just finished anchoring the Nov. 18 edition of the Centre County report. She isn’t a fan of simply posting the newscast online. “You can’t expect the digital audience to watch a 30-minute newscast – that’s not what they want,” she said. News organizations like the New York Times and the Guardian have been experimenting with short news summaries. Reuters has a 10-minute news summary that airs on Netflix. So we wanted to see if we could combine a 90-second news summary with links to all the stories in Verse. The Verse platform changes the equation because it is highly interactive, and high rates of interactivity mean stronger viewer engagement. Salazar wrote a script that focused on the most important and interesting stories from the full newscast. We recorded it on the Centre County Report set. She edited the video in Adobe Premiere and imported the summary and the news stories into Verse. Three hours later the first Centre County report Digicast was online. “Verse’s content management system is easy to use. Having done this once, I could cut down the time at least an hour,” Salazar said. Classmates, faculty and the Verse development team all responded positively to the Digicast. “Verse’s hotspots give viewers the option to choose which story to watch without having to view the entire newscast. This concept separates the Digicast from other online newscasts,” Salazar said. 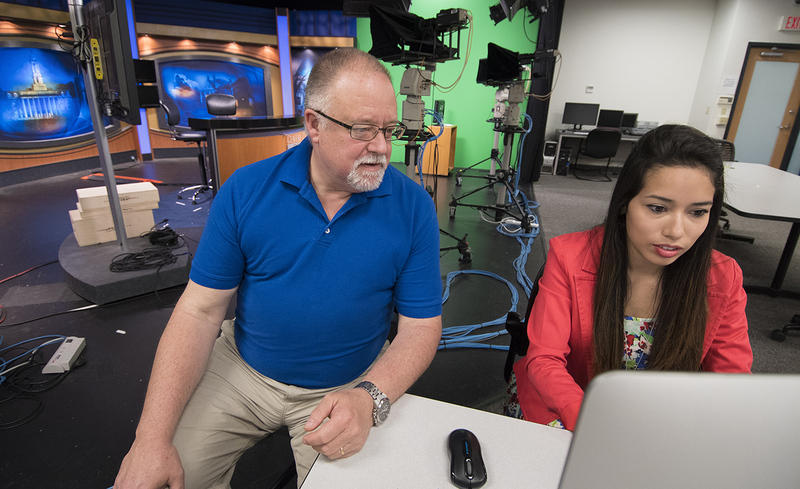 Steve Kraycik, the former KOMO-TV news director and senior lecturer who supervises the Center County Report, is now working on incorporating the Digicast into next semester’s version of the class. Salazar and Chandler are mapping out how to create versions of a Digicast optimized for mobile and desktop audiences.